With 10,582 square kilometers (4,086 sq mi), this Salar de Uyuni is the world’s largest salt flat! It is located in the southwest Altiplano (High Plain) of Bolivia at an elevation of 3,656 meters (11,995 feet) above sea level. The Salar de Uyuni is part of the Altiplano a high plateau, with an average altitude higher than most peaks in the Alps and Rockies. The Altiplano formed when the tectonic plates of Nasca and the Antarctic moved underneath the South American continental plate, creating in the North the Andes Mountain Range and in the South two Andean ridges flanking a mostly flat, high basin. The plateau includes fresh and saltwater lakes as well as salt flats and is surrounded by mountains with no drainage outlets. Recent research shows that the Andes Mountain Range and the Altiplano were relatively rapidly formed over a period of 10 million years between 16 and 6 million years ago. The geological history of the Salar is associated with a sequential transformation between several vast lakes. Some 30,000 to 42,000 years ago, the area was part of a giant prehistoric lake, Lake Minchin (named after Juan B. Minchin from Oruro). When it dried, it left behind two modern lakes, Poopó Lake and Uru Uru Lake, and two major salt deserts, Salar de Coipasa and the larger Salar de Uyuni. Lake Poopó is a neighbor of the much larger Lake Titicaca. During the wet season, Titicaca overflows and discharges into Poopó, which, in turn, floods Salar De Coipasa and Salar de Uyuni and causes the brown layers in the salt blocks. The Aymara people are the original inhabitants of the Andean and they have another explanation about the origin of the Salar de Uyuni. Their legend tells that the mountains Tunupa, Kusku and Kusina, which surround the Salar, were ones giant people. Tunupa married Kusku and got pregnant. But Kusku then betrayed her and ran away from her with Kusina. Grieving Tunupa started to cry while breast-feeding her son. Her tears mixed with milk and formed the Salar. Many locals consider the Tunupa an important deity and say that the place should be called Salar de Tunupa rather than Salar de Uyuni. At certain places the flat white salt plain is interrupted by islands with porous surfaces. These ‘islands’ are the tops of old volcanoes, from the era of the Minchin Lake and provide fertile soil for many cactuses. The most known Island and main tourist attraction is called: “Inca Wasi”, House of the Inca. Although the Inca’s have most likely never visited the island, it’s a good name to attract tourism. You can make short walk of half an hour over the island, admiring the amazing surrealistic views and huge cactuses. Some of these cactuses are even more than 10 m high and knowing that they only grow about 1 cm each year, it gives you an idea about their estimated age! Another mayor tourist attraction is the original Salt Hotel, build between 1993 and 1995. This salt hotel is located in the middle of the Salar flat and almost completely constructed from rectangular blocks of salt, that were cut manually out of the salt desert. Unfortunately mismanagement of the hotel caused (sanitarian) problems and between 2002 and 2008 the hotel closed and re-opened several times. It also changed from owner and now seems to be owned by the Bolivian government, who recently (2013/ 2014) extended the buildings and made it less authentically (even using ordinary bricks within the walls…). It is now a popular place for (day) tours to eat their own lunches inside the new dining room, protected from the wind and sun outside. If you want to make pictures inside the hotel, you have to buy something (soft drink, chocolate, souvenir, etc.). It is again/still possible to sleep in the original salt hotel, but it isn’t easy to get a reservation. It is a very original place to sleep, but as in comfort and hygiene it isn’t very recommendable. At least 3 more (at the time of writing) salt hotels have been built at the edges of the Salar, nice hotels, but at very ugly locations, close to the town of Colchani. The Salar de Uyuni is estimated to contain 10 billion tons of salt, with an average thickness of one till 8 meters. A very small part of this amount (25,000 tons) is yearly harvested by the mineworkers from the village of Colchani. They only receive about 3 US$ for each 50 kg of salt that they dry, clean and put in bags of 1 kg each. 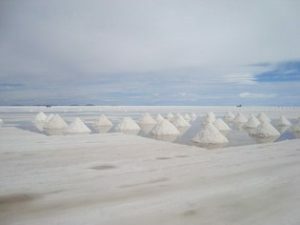 You can buy their salt only in Bolivia. The Salar flat has a relatively stable average temperature with a peak at 21 °C (70 °F) in November to January and a low of 13 °C (55 °F) in June. The nights are cold all through the year, with temperatures between −9 and 5 °C (16 and 41 °F). The unique features of the Salar de Uyuni make it a popular tourist destination for tourists from all over the world. 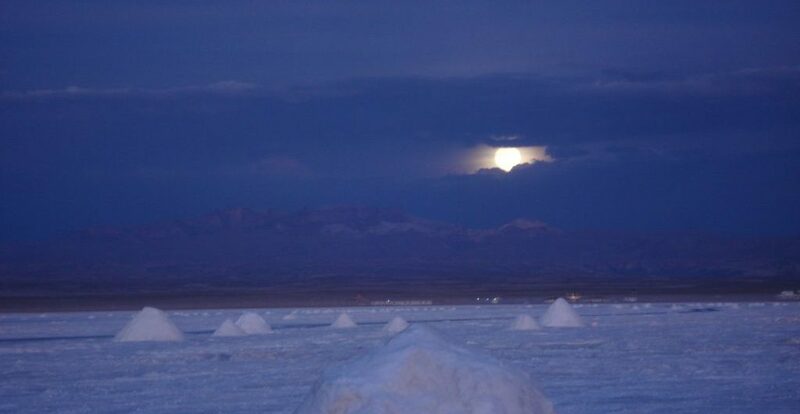 There are many different travel agencies that offer tours to the Salar de Uyuni. Most of them follow similar itineraries with small adjustments, partly depending on where you spend the nights. The 4×4 cars used during these tours are often big (older) Toyota Land Cruisers, or similar models with place for 6 persons in the back and one person next to the driver. Sometimes there goes a cook with, but nowadays it happens more and more that agencies use the ‘cooks’ from the basic hostels/ shelters where you spend the nights. During the full day tours lunch is included and during the 3 days tours you have 3 times lunch, 2 times breakfast and 2 times dinner included. The quality of the food is decent and there is usually enough. During the longer tours your entire main luggage will go on top of the car and will be completely wrapped with plastic, not so much against rain, but mostly against the small dust of the desert. During the longer Salar tours you will have to deal with a lot of dust, hot temperatures inside the 4×4 and cold temperatures outside. Therefor it’s important to bring warm wind-tight clothes and to dress in layers. Don’t use thermo underwear during the day, as this will be too warm inside the car and difficult to change. One exception can be made when visiting the geysers, because you can change at the hot springs. It is also very important to bring a good sleeping bag, or hire one for about 10 US$, especially for the night at the refuge of Laguna Colorada and the morning after. 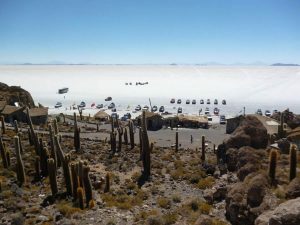 There are almost no (English) speaking guides who live in Uyuni, therefore during 95% of the Salar tours the driver will also be your basic Spanish speaking guide. With the information above it is pretty clear that the driver and car are the two most important elements during this tour. Since you will likely not able to meet/ see either of them when you buy a tour online or in the evening, it can be handy to go ‘shopping’ just before the tours leave (between 10:00 and 10:30 am), or when they start coming back, between 15:30 and 18:30 h. It is also very good to ask other travelers about their experiences. Two good agencies are Tonito Tours (from the same owners as Minute Man Pizza) and Your Travel. Although there are several small shops along the way, which sell mostly sweets, water and toilet paper, I strongly recommend you to bring enough to drink with you. For a 3 days tour you can buy big 5 liter bottles of water. Write your name on them and use them to re-fill your day-bottle. With the higher altitude, bright sun and dry air, you need to drink at least a liter more during the day than you normally drink to prevent dehydration and altitude sickness. More information about altitude sickness you can find at: Tips about Altitude Sickness. 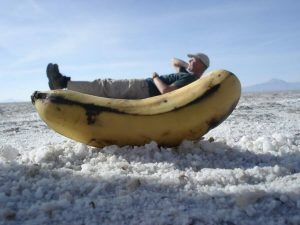 Below I will give a short description about the 3 most common tours through the Salar de Uyuni. The itineraries are a good indication, but not to be taken exact. Departure time from Uyuni is between 9:00 and 10:00 am, in the summer earlier than in the winter, when it’s much colder. In about 15 minutes you drive to the ‘Train Cemetery’. In the past Uyuni served as a distribution hub for trains carrying minerals en route to Pacific Ocean ports. The rail lines were built by British engineers, who also brought their typical bowler hats to Bolivia. Why the Bolivia women instead of the Bolivian men started to use these hats is not very clear. The construction of the railway finished in 1892, but when the mining industry collapsed around 1940, many trains were abandoned and due so, producing the train cemetery. From the cemetery you drive in 45 min. to Colchani. Colchani is a small dusty town were still about 20 families make a living from what the Salar de Uyuni provides them. They mostly sell dining salt (see above) but also salt blocks and original souvenirs made of salt. Sometimes it is possible to watch a small demonstration of how the salt is extracted from the salt flat. Note: Colchani is the last place with a more or less decent toilet until Inca Wasi Island. To continue the demonstration about the salt process, we drive 15 min further to the edge of the gigantic Salar de Uyni salt flat, where you find rows with small men-made hills of salt. Due to gravity and the heat of the sun, the water from the salt sinks down and evaporates. When the salt is dry enough it will be brought to Colchani for further process. Please do not climb the little salt hills and do not take any pictures of the men who are working very hard in the burning sun for just a few dollars a day. The salt workers prefer to be left alone. Then it’s about 20 min. to the original salt hotel, or at least partly original, in the middle of the salt flat. It is still interesting to make a view pictures of the building, that’s for a big part made with walls of rustic salt blocks and a roof of Andean grass. Some travel agencies have lunch at the Salt Hotel, most will lunch on Inca Wasi. From the Salt hotel you drive about an hour over 90 km in a straight line towards the Inca Wasi Cactus Island. Somewhere in the middle your driver will make a stop so you can appreciate the strange hexagon shaped salt figures on the ground. The full story of how these shapes arise is very scientific, but shortly written it’s because the electromagnetic forces within and between the different salt/ sodium molecules. At this special spot surrounded only by the white floor and blue sky for miles around you, you can also take very original and funny pictures, where people are smaller than their cellphone, or where it seems that you can carry the 4×4 just on one hand. The trick of these pictures works by playing with the distances of the objects and/or people. Everything that you want to make big needs to be close to the camera and everything that needs to be small, needs to be further away. I recommend you to give it a try and try to be original, it’s fun. Arriving at Inca Wasi Island usually lunch will be served. Inca Wasi also has the only clean toilets in and around the Salar de Uyuni. If you want to walk over the island (recommendable) then you will have to pay a 30 Bs (4.5 US$) entrance fee. Keep in mind that you will walk in the full sun and at an higher altitude, between 3660 and 3800 m, which makes the short circle a bit tougher that it first looks. After the walk it’s time to back in the direction of Uyuni. Most drivers will still make 2 stops, one in the middle of nowhere again for making funny pictures and one at a place where there are some small holes in the surface. These small holes contain water and if you stick your hand in them you might be able to break off a small piece of strangely shaped salt crystals. At the moment of writing it isn’t allowed anymore to wait and take sunset pictures over the Salar. This because of an accident that happened on the dark road between Colchani and Uyuni. Day 1: Departure time from Uyuni is between 10:00 and 10:30 am, in the summer earlier than in the winter, when it’s much colder. The first day of this tour is very similar to the one-day tour, only from Inca Wasi you continue further to the other side of the Salar. It takes about 75 min. to reach Bellavista and more than 2 hours to reach the village of San Juan. Both are popular places to spend the first night in a very basic hostel. Most of these hostels consist of a dining room and a few dorms with shared bathroom. The beds are short and old, but alright to sleep on. You will also get sheets and several blankets. These are not dirty, but how clean they really are is difficult to say, keeping in mind that there is often not enough water available. When there is enough water available for both the toilet and shower, then you will usually have to pay a little extra to be able to use the shower. Day 2: Although you won’t see the Salar anymore, today is often considered to be one of the most impressive days of the 3-days Salar de Uyuni tour. Traveling through the dusty desert you will first pass several local villages, fields with quinoa plants, many cactuses, lama’s, alpacas and several vicuñas (3 of the 4 South American camels species). After passing by the smoking 5800 meter high Ollagüe Volcano, right on the border with Chile we will visit several high altitude lakes. These shallow lakes are rich in minerals and pink algae, the main food of the elegant flamingo. Every November these lakes are the breeding grounds for three species of pink South American flamingo: the Chilean, Andean and rare James’s flamingos. This summer time is the best time to see many flamingo’s, but also during the winter you will likely be able to spot several flamingos. After passing the famous “Arbol de Pierda” (Stone Tree), you will visit the last lake of today, called: “Laguna Colorada”. This lake is very rich of minerals, including borax, copper and iron, which provide the lake with different colors. Especially when there’s a lot of wind, the lake colors almost blood-red. 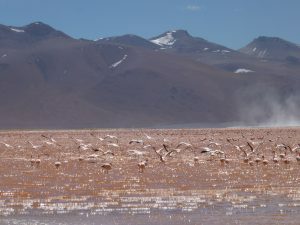 Try to picture a red lake at an altitude of 4200 m, with a white borax beach, rigged mountains on the back and many elegant flamingos standing in the shallow water. Holding this image in mind I guess it isn’t a surprise that Laguna Colorada is part of the National Eduardo Avaroa Wildlife Reserve (REA), established in 1973. This National Reserve covers around 714.745 km2 and protects several of the high altitude lakes and flora and fauna native to this area, including about 80 species of birds, vicuñas, Andean foxes, viscachas, etc. The entrance fee to this National Reserve is 150 Bolivianos, which some agencies include in their price and others not. Please verify when buying your tour. Most tour agencies have their tourists sleeping in the very basic refuges on the shores of Laguna Colorada, an idyllic location, but very basic and cold (outside the temperature can get below 16 C.) location with poor hygienics. Beds are short and basic with many blankets, but during winter (June, July, August), this might not be enough. Some agencies stay now as an alternative in a hostel in Villamar at an altitude of 3700 instead of 4200 m. This place is more comfortable, but also more expensive and you will miss a small bit of the original tour itinerary. 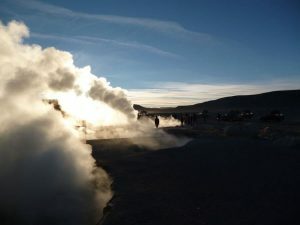 Day 3: Today you will have to leave very early (5:30/ 6:00 am) to be able to see sunrise through the steam of the geysers. 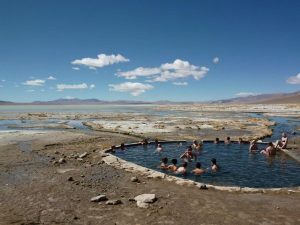 These geyser, called ¨Sol de Mañana¨, are located about an hour away from Laguna Colorada, at an altitude of 4850 m. Note: Especially during winter time it will be very cold early in the morning and most 4×4 have no heating, so it is recommendable to take your sleeping bag with you in the car. After breakfast the tour continues to the so called “Dali Rocks”, Laguna Verde (full with copper minerals), Licancabur Volcano and Laguna Blanca. The tourists who go to Chile will be brought to the border office just after Laguna Blanca. 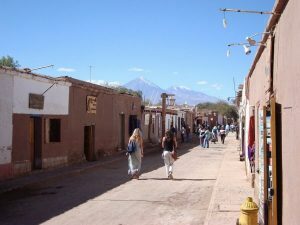 After their border formalities with the migration of Bolivia, they travel with shared transport to the immigration of Chile in the small town of San Pedro de Atacama, 45 min. from the border. The tourists who go back to Uyuni have a long ride ahead, with great sceneries, but just a view short stops. One at the other side of Laguna Colorada, Then a late lunch in Villamar, a small town, protected from the wind by a rocky wall. From Villamar it takes a bit more than 3 hours to drive back to Uyuni, passing small towns like Culpina K and San Cristobal. You will likely arrive back in Uyuni around 17:00 h.
For tourists who do the 3-days tour from San Pedro de Atacama to Uyuni, the itinerary is quite similar, just backwards. However on the first day they will have lunch at the hot springs and then drive to the geysers, which will look more like steaming mud pools. Because it is less cold in the afternoon, there will be less steam. Since San Pedro de Atacama is only at an altitude of 2400 m and the refuge at Laguna Colorada above 4200 m, there are now more and more agencies who want to lower the risk that their clients get trouble with altitude sickness and therefore drive 2 hours past Laguna Colorada to sleep in Villamar at around 3700 m altitude. Day 1: From Tupiza you ascend the beautiful Quebrada de Palala to El Sillar which has a fantastic moon landscape. After taking some beautiful pictures, will continuing to the mining areas of Nazarenito, Chilcobija, Cerrillos, Polulos, Rio San Pablo until we reach the abandoned village of San Antonio de Lipez. In this village one can obtain textiles and lytic arrows of the place. This morning you will visit the colonial ruins of San Antonio, also known as Ghost Town, the Torreón, Laguna Morejón, Quetena, where you can take a bath in the hot springs of Chalviri. After relaxing our muscles in the warm water, we continue to Laguna Verde, at the foot of the Volcano Licancabur (5960 m), Then you cross the Desert of Dali with its fabulous shapes of ignimbrites. From the desert, you go up to 4850 m, until the ¨Sol de Mañana¨ geysers, volcanic craters with effusions of sulfur vapors and heavy water. 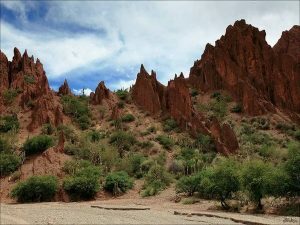 After visiting these ‘Witches Pots’ you drive further until reaching Laguna Colorada, where you spend the night in the basic refuge. After breakfast our tour crosses de Desert of Siloli where de famous ¨Arbol de Piedra¨or ¨Stone Tree¨ can be seen. Then we continue along the “Camino de las Joyas” (Jewels Road) with a set of small lagoons: Laguna Ramaditas, Laguna Honda, Laguna Chiarkota, Laguna Hedionda, Laguna Cañapa, sanctuaries of 3 varieties of flamingos. The tour passes also by the foot of Volcano Ollague (always active), Tomasamil (5900 m), and the Salar de Chiguana to conclude at the end of the day in the town of San Juan. It takes about an hour and a half to drive from San Juan to the Salar de Uyuni. The highlights of today include: “La Cueva del Diablo” (the devil´s cave), the island Inca Wasi (house of the Inca) with its giant cacti, the first salt hotel, and an Iodized Salt Processing Plant in Colchani. The journey ends visiting the Train Cemetery just outside of Uyuni. During raining season, around January the surrealistic salt flat of Uyuni turns into a giant flat mirror. With the right light this phenomenon provides mind blowing scenery and great photo opportunities! On the down side, if the water level is too high, you might not be able to reach the Inca Wasi Island. Within the information above I’ve mentioned the most known highlights around the Salar de Uyuni, but for those who have time (and their own car) there are many more lesser known highlights to be visited, including: Laguna Violete, Laguna Negra, Bosque de Pierdas, etc. Under need the salt crust you can find borax (used to make ceramics for toilets etc.) and also a hidden pool of lacustrine mud, interblended with salt and saturated with brine. The brine is a saturated solution of sodium chloride, lithium chloride and magnesium chloride in water. Of those, lithium is arguably most important as it is a vital component of many electric batteries. 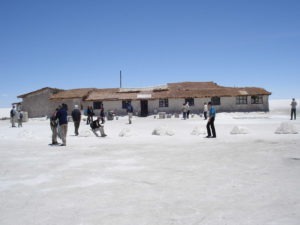 With estimated 9,000,000 tons, Bolivia holds about 45% of the world’s lithium reserves! 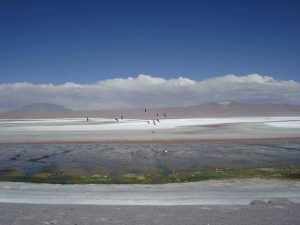 For environmental reasons and due to strong local protests, you can find at the moment only small borax plants in and around the Salar and there are currently no big mining plans for lithium. 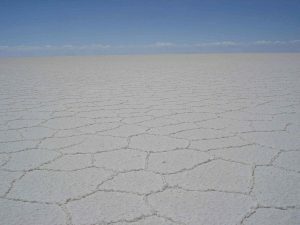 The Bolivian government does not want to allow exploitation by foreign corporations anymore, but lacks the knowledge and experience to extract the lithium themselves. It now intends to build its own pilot plant with a modest annual production 1,200 tons of lithium and to increase it to 30,000 tons in the future. 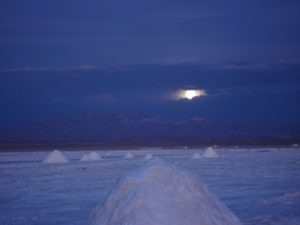 Salt flats are ideal for calibrating the distance measurement equipment of satellites because they are large, stable surfaces with strong reflection, similar to that of ice sheets. As the largest salt flat on Earth, Salar de Uyuni is especially suitable for this purpose. In the low-rain period from April to November, due to the absence of industry and its high elevation, the skies above Salar de Uyuni are very clear, and the air is dry (relative humidity is about 30%; rainfall is roughly 1 millimeter per month). The combination of all these features makes Salar de Uyuni about five times better for satellite calibration than the surface of an ocean. Using Salar de Uyuni as the target, ICESat. has already achieved the short-term elevation measurement accuracy of below 2 centimeters. Next postSpanish lessons before traveling to Ecuador, Peru or Bolivia?